Having your website show up on page 12 on Google is like having a retail store on Mt. Everest. If no one finds you, you won’t be successful. Search Engine Optimization is an important part of your website. Ideally, your website was optimized for search when it was developed, but if your site was developed more than a year ago chances are it is not up to date with current Search Engine Optimization rules and procedures. The Major Search Engines like Google, Yahoo and Bing are continually redefining how websites are ranked organically. It is possible for you to keep up with current search engine algorithms, but most likely you have other things to do with your time . 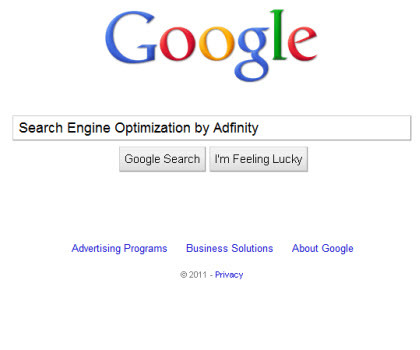 Your best bet is to hire a Search Engine Optimization Firm like Adfinity. At Adfinity it is our job to keep up with the current Search Engine Trends and to make sure your website is compliant with current Search Engine Rules. When the rules change, and they do change often, we adapt our SEO Service to keep pace with these quickly changing SEO Rules. Call us SEO Experts or Search Engine Consultants, we do understand the complexities required to get you the Organic Rank you need to be found. There are a lot of Search Engine Optimization Firms that will sell you an expensive, one time, fix for your website’s Search Engine Optimization problems. It is essential to understand that SEO optimization is an ongoing process that involves continuous updating and adding content to get your site ranked and keep it there. Don’t be fooled into thinking that once you are in favorable position your work is over, because it is not. Your competition is also redefining their SEO and will try to take your over your position. The more competitive your search terms are the more likely you are to be displaced. Effective Search Engine Optimization is no big secret. At Adfinity we have no problem explaining the process involved to you. It is up to you to decide whether or not it is something you want to tackle on your on or something you want leave up to a Search Engine Optimization Company. Contact us and we will be glad to give you a free, no obligation, consultation to help you improve your Search Engine Ranking.